IGT, with personality, structure, complexity and a pleasant bouquet: the quality of this Sicilian red importantevino their roots in local values ​​and care put into production. The grape, Nero d'Avola, Cabernet Sauvignon and Merlot are vinified using the traditional method. 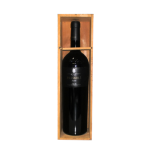 The wine makes a cure at least twelve months in oak barrels and an excellent refinement of 10-12 months in glass. In the tasting, this IGT is deep ruby ​​red with garnet. The aroma is complex, intense, spicy, with distinct sensations of cherry and vanilla. The taste is warm, very velvety, with great structure and aromatic persistence. Among Sicilian wines, the triskele is particularly good with red meat dishes, game and some cheeses.